When it comes to taking care of your family, we take our jobs very seriously. To us, family dentistry is about more than just checkups and cleanings. Having healthy teeth is important not just for your oral health, but your overall well-being, too. To start your family on the right path towards having a healthy smile for years to come, Dr. Joshua Holcomb is your family dentist in Collierville, TN. His team will provide all the comforts you and your family deserve while providing gentle care that you won’t find anywhere else. Providing excellent family dentistry services is what we do best! Strong, healthy teeth are important. How important? Let’s start off with the basics, like eating. A healthy set of pearly whites allow you to chew freely, which promotes proper digestion and a healthy diet. On the flip side, a glowing smile will encourage you to meet new people and lead an active lifestyle. Maintaining good oral health requires a lifetime commitment to practicing good oral hygiene and visiting the dentist regularly from childhood forward. We want to be your trusted partner, to ensure that you maintain not only a beautiful smile, but a strong, healthy and disease-free body, too. General dentistry – Restorative, cosmetic, preventive and sedation dentistry are all available under the general dentistry umbrella. Children’s dentistry – Trivia time: did you know according to the CDC, more than 19% of kids have untreated cavities and roughly 14% have decay in their baby teeth? We offer dental sealants, fluoride treatments, orthodontics and more. 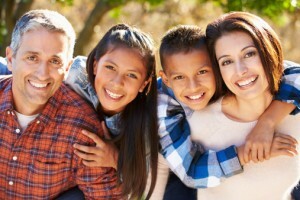 Family Preventive Dentistry – More than 90% of all systemic diseases have oral manifestations. We offer treatments and more including oral cancer screenings, gum disease prevention and treatments, and composite fillings. Dr. Holcomb will ensure you and your family’s smiles stay disease-free for years to come. As a family dental practice, we help patients of all ages understand and maintain their oral health. Collierville family dentist Dr. Isaacson and our team are here to answer any questions you may have. Your family’s dental health is a serious matter, and we aim to provide dental care that goes above and beyond your expectations. We proudly serve all patients in and around the Collierville, TN area including Germantown, Pembrook, Memphis, Bartlett, Olive Branch and the surrounding communities. Your family dentist in Collierville is ready to help!